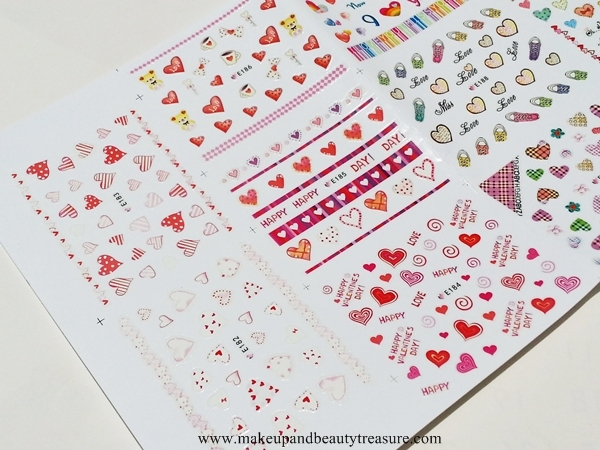 I have always been fond of Born Pretty Store Nail Art Stickers (I had reviewed golden nail art stickers HERE). 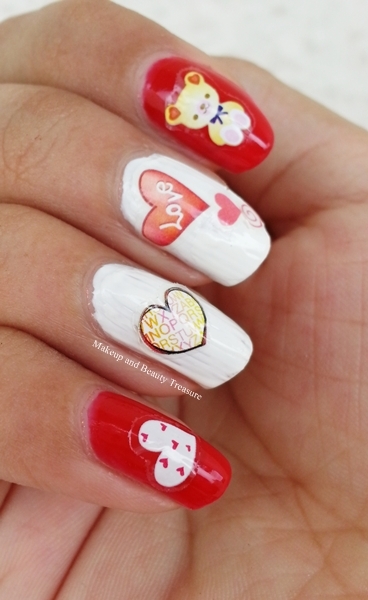 These days I am going all lovey dovey (my marriage is in December :)) and these heart nail stickers* instantly caught my attention and I knew I had to get them. They are priced at $5.98 and you can buy online HERE. Use the code MEGW10 to get 10% off on your order. 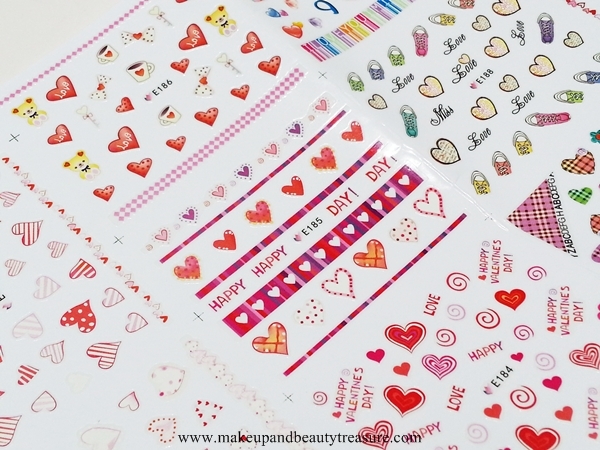 The nail art stickers set comes in a large plastic pack wherein the stickers are stuck onto a thick white to protect the stickers from getting spoiled or damaged. It can be folded lightly and can be easily carried around in a handbag. It contains 11 sets of designs including colorful hearts, love captions, teddy bears, bows, mugs and all other lovey dovey designs. 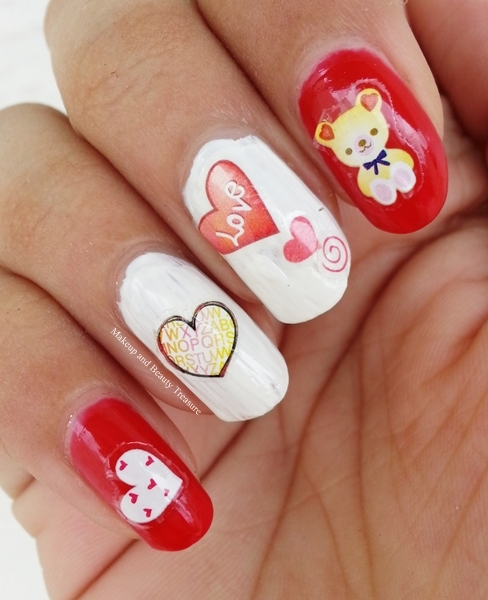 Each sticker is made of colorful thick plastic which lay flat on nails and feels like nail art water decals. It doesn’t tend to stick to itself upon application. I use tweezers to pull the stickers off the sheet and apply them onto my nails. I then put a little pressure to make sure the stickers are stuck well and won’t peel off. The stickers look very pretty and adorable on my nails. They are quite lightweight and I don’t feel like I have anything on my nails. It takes only 10 minutes to apply the stickers on all your 10 fingers. The stickers are super easy to apply and it doesn’t require you to be a nail art expert. They last for a good 6-7 days without wearing off or sliding around the nails. I always apply a top coat as per the instructions to make the effect last longer. 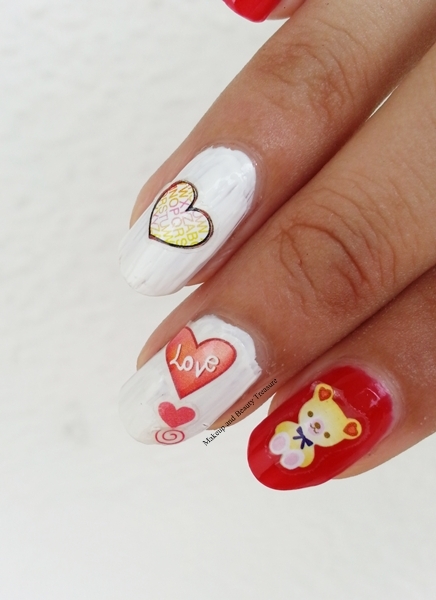 I used gorgeous hearts and cute teddy for a romantic manicure. And guess what? I got lots of compliments from my friends, my boy and my parlor aunty *happy dance*. They can be easily removed or peeled off using a good nail polish remover. They do not leave glue residue behind. • Look very pretty on nails. • Feel super light on nails. 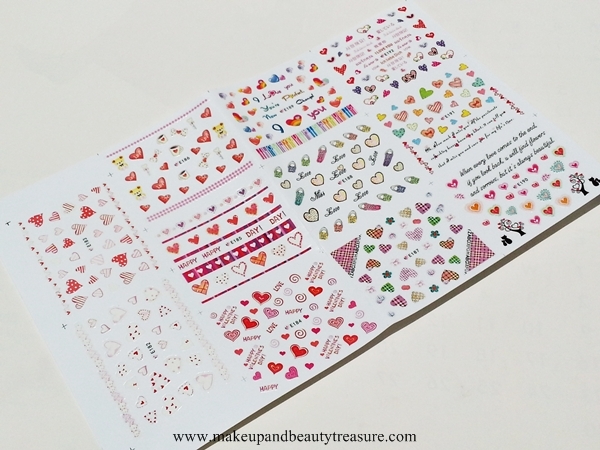 • 11 set of nail art stickers in one pack. 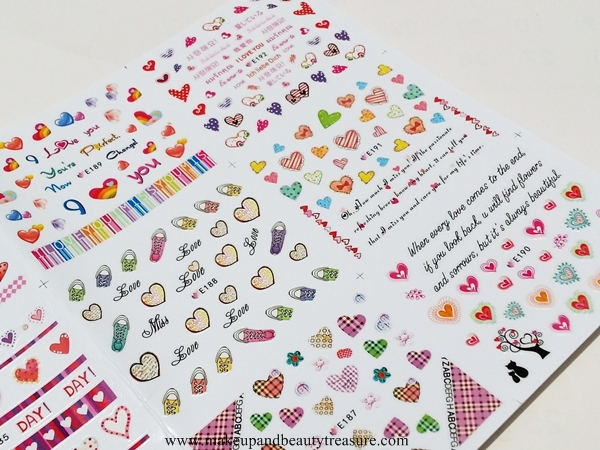 If you love lovey dovey things then you must grab these heart nail art stickers from Born Pretty Store. They not only look adorable but last for at least 6-7 days on nails without getting dull. I totally love these and would HIGHLY RECOMMEND to everyone! • Always apply base coat to prevent your nails getting stained from dark nail polishes. • Before applying nail art stickers, make sure the nail polish is dry. • If you do not have long nails to peel stickers, use tweezers. • Apply top coat to make your nail art last long. 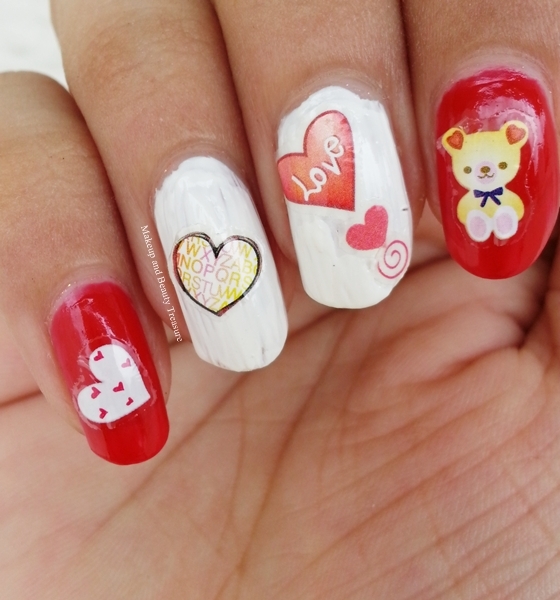 Do you love hearts or cute things on your nails when you get lovey dovey ;)?